Modelling is probably one of the best part time jobs you can ask for, it’s great for networking, stepping outside of your comfort zone and an amazing confidence boost. However, you must remember you’re making somebody else’s vision come to life, so you may have to compromise. Especially, when it comes to hair jobs. Whether it’s just a trim, or a complete make-over, you must be willing to make a change. This can often prove more difficult than it seems. The client’s and the model’s perspectives are often completely different. The client concentrates on the fact that they are paying the model, so they should be able to do whatever they like to their hair; they want the model’s hair to be a canvas for their work. Whereas, the model thinks about the post-shoot feeling of “can I live with this?” and what they will look like with bright blue hair or a pixie-cut! So, the question is: who is right? There is no real answer to this, the most important thing to do in that situation is talk through it, set out some boundaries and compromise. “I modelled for Mary, who is an extremely talented hairdresser from Keith Hall Nottingham. 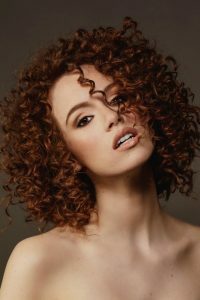 The job was for her to enter the Trend Wella Vision competition for a second year (last year she took home the silver, coming second in the UK). It was my first job that I had agreed to let anyone change the colour of my natural ginger hair. Even before agreeing and confirming the job, I had a consultation with Mary to speak through exactly what she will be changing and to look at colour samples. I was more than happy with what she showed me. Photographs taken by: JnKo Photography, Paige Young. The truth is, most of the time we absolutely love seeing the results, and it’s very rare for the model or the client to walk away unhappy, but it’s important to take everybody’s ideas, feelings, time, money and hair into consideration. After all, it can be a big change.